Story: The newest Indiana Jones adventure begins in the desert Southwest in 1957 - the height of the Cold War. Indy and his sidekick Mac have barely escaped a close scrape with nefarious Soviet agents on a remote airfield. Now, Professor Jones has returned to Marshall College - only to find things have gone from bad to worse. His close friend and dean of the college explains that Indy's recent activities have made him the object of suspicion, and that the government has put pressure on the university to fire him. On his way out of town, Indiana meets rebellious young Mutt, who carries both a grudge and a proposition for the adventurous archaeologist. 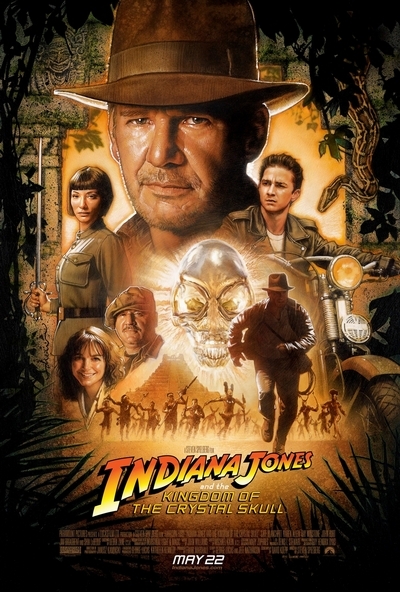 If he'll help Mutt on a mission with deeply personal stakes, Indy could very well make one of the most spectacular archaeological finds in history - the Crystal Skull of Akator, a legendary object of fascination, superstition and fear. But as Indy and Mutt set out for the most remote corners of Peru - a land of ancient tombs, forgotten explorers and a rumoured city of gold - they quickly realise they are not alone in their search. The Soviet agents are also hot on the trail of the Crystal Skull. Chief among them is icy cold, devastatingly beautiful Irina Spalko, whose elite military unit is scouring the globe for the eerie Crystal Skull, which they believe can help the Soviets dominate the world ... if they can unlock its secrets.